The MCBA board usually enjoys the off-season by attending a few meetings and monitoring what is going on with our state fishery and then presenting the information to the membership. This past winter, issues have taken our board members from 10s of hours to 100s of hours, and now to 1000 hours of advocacy to protect our sports fishery. It started in November with the lame-duck legislative session and Senate Bill 1145, a proposal to open Lake Superior and Lake Michigan to net lake trout by state licensed commercial fishermen. With the whitefish population in decline, lake trout numbers rising, lake trout are on the hit list as a target species by commercial fishers. We kept the pressure on our legislators all the way through January 1, 2019 when the lame duck session finally recessed and the bill died in committee. I want to thank all our members who backed us with your support of emails, phone calls, and letters to our legislators NOT to support SB 1145. Standing united, we made a difference! In January we attended the Michigan Fish Producers Meeting. We were trying to understand where the commercial fishing industry stands in regards to the Tribal Decree, as they are also part of the upcoming negotiations. Commercial fishers have made it clear they want to target lake trout and walleye as part of their by-catch. Mid-February brought another explosive issue when it was learned sports fishermen had exceeded their Total Allowable Catch (TAC) in Traverse Bay during the 2018 season. Within the guidelines of the Tribal Decree, the sports fishery is allowed 77,200 pounds of lake trout in MM4. Their reported catch of 93,000 pounds exceeded the TAC by more than 20 percent. If the state or the tribes exceed harvest limits by more than 15 percent, there is a penalty for the following season. Therefore, recreational anglers will be required to reduce their catch by nearly 32,000 pounds. The sports fishery will be allowed approximately 61,000 pounds for the 2019 fishing season. A public meeting was held March 6 in Traverse City. Frustrated anglers were presented with seven possible proposals by the DNR to try and save their fishing season from complete closure. After extensive debate, two of the proposals were accepted. Option 1 offers a January 1 to September 30 lake trout season with a 15-inch minimum size limit and one fish daily bag limit. With Option 2 the fishery would open May 25 to September 2. May 25 to July 31 would have a 15-inch size limit and a two fish daily bag limit. August 1 to September 2 would have a 15-inch size limit and a one fish daily bag limit. On March 7 the Lake Michigan Citizen Advisory Committee met and voted to support Proposal 1. There will be a hearing on March 14 with the Natural Resources Commission (NCR). It is hoped they will accept the regulation change, which is within the guidelines of the Tribal Decree. Implementation of the new regulation should go into effect by mid-April. 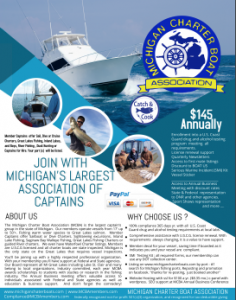 The foregoing all illustrate why MCBA is so adamant on raising funds to support the Coalition to Protect Michigan Resources during the Tribal Decree negotiations. We must stand our ground if we expect to stay in business. If we donít, the fishery will belong to the tribes and commercial fishing, and sport fishing will become a thing of the past.